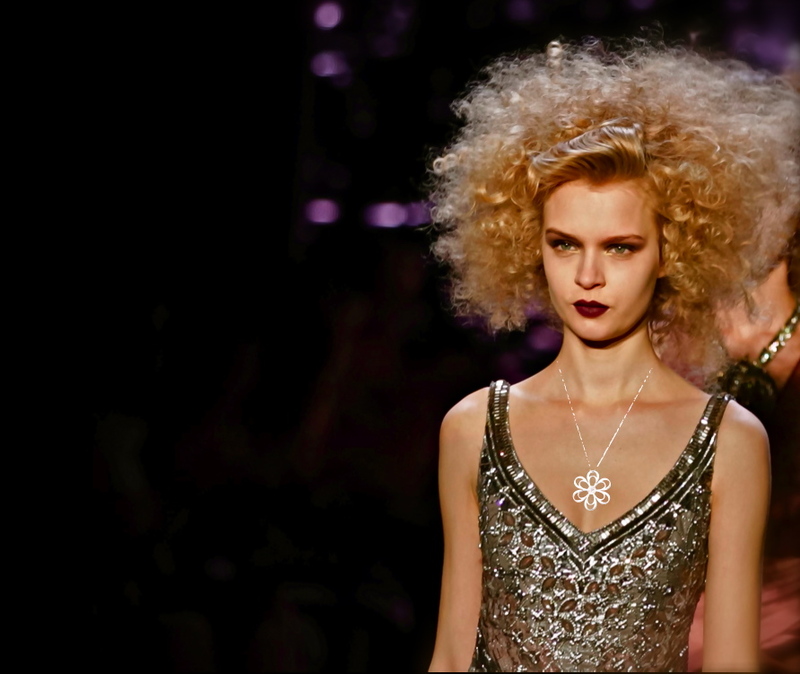 Big, luxe, and on-trend for 2014. Our over-sized collection is made up of our "I Love You Butterfly (in New York Magazine Feb 2014 and People Style Watch Jan 2014), Mandala, Double Daisy, and Seed of Life designs. Please scroll down to see all. Choose highly polished solid Brass (gold tone) or White Bronze (silver tone). About 2” in size and comes on a chic 28” AND a black cord so you can wear it however you want - high or low. Made in New York. Now our classic butterfly comes in a fashion forward oversized version. So cool, so stunning, so meaningful, in its free-form glory. 813 means “I love you”...8 letters, 3 words, 1 meaning. The 1 is in the middle because love is the center of everything.® We formed the numbers into a butterfly that signify you're becoming the change you'd like to see in the world. Because love can be transforming. 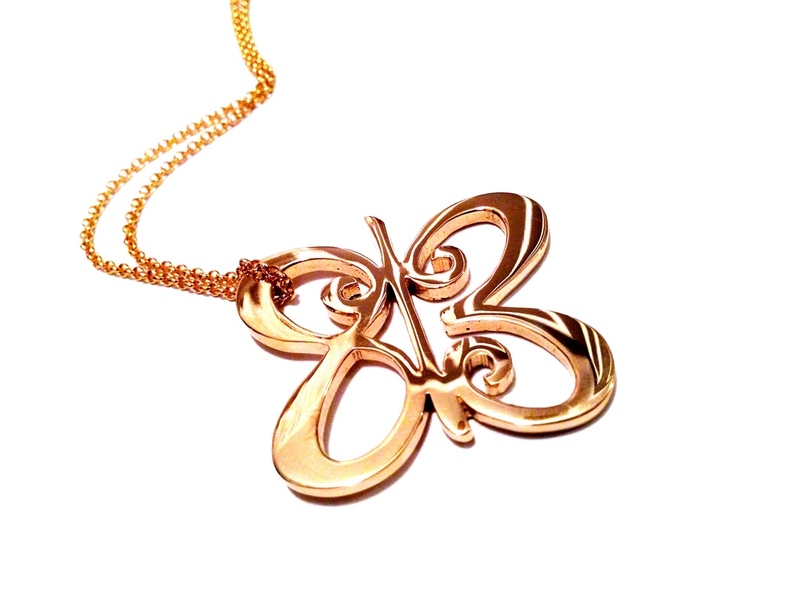 Our butterfly and its message of “I love you” faces out to the world and inward to the wearer simultaneously and will remind you of the reflective power of love. Butterflies are special creatures and signify spiritual rebirth, personal growth, or a guiding soul. Choose highly polished solid Brass (gold tone) or White Bronze (silver tone). About 2.5” in size and comes on a chic 28” AND a black cord so you can wear it however you want - high or low. Made in New York. Super sophisticated with a nod to the bohemian. Loosely translated to mean "circle," a mandala is far more than a simple shape. It is a spiritual symbol in Hinduism and Buddhism, representing the universe. Mandalas are tools for meditation and used for gaining wisdom and compassion. Generally depicted as a tightly balanced, geometric composition that is personally meaningful to the one gazing upon it, the mandala serves as a guide to individuals along the path to enlightenment. Its purpose is to help transform ordinary minds into enlightened ones. Our Mandala is ultra feminine and houses our meaningful I LOVE YOU BUTTERFLY in its core, symbolizing that regardless of your religion, love connects us all. NEW!! Comes on a 28" chain AND a black cord so you can wear it however you want - high or low. So Chic! Choose highly polished solid Brass (gold tone) or White Bronze (silver tone). About 2” in size. Made in New York. Eye-catching and meaningful, the design of this pendant consists of our meaningful I Love You Butterfly encircled for extra emphasis that “love is all around.” We like to think that when you wear this symbol you're showing your support for tolerance and kindness - that you're acting as the change you'd like to see in the world. A statement piece in a feminine design of two daisies with our One Meaning Butterfly in its center, made of 813 which means “I love you"...8 letters, 3 words, 1 meaning. The 1 is in the middle because love is the center of everything. This piece represents the power of two... friends, lovers, or mother and child - even a second chance at life. Our symbol for perpetual love is at its core. 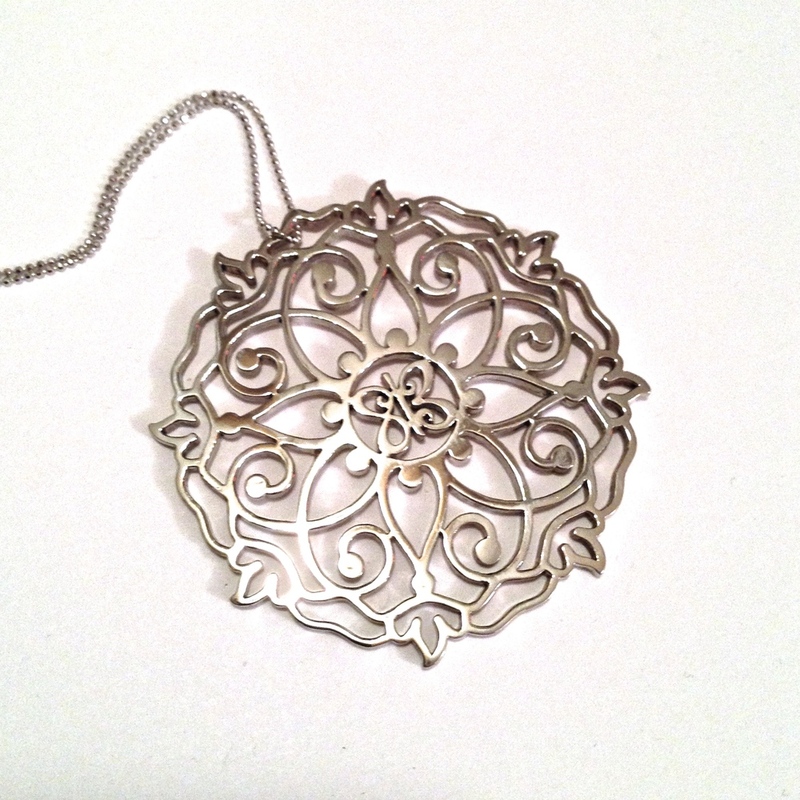 This pendant is a substantial, stunning and meaningful piece. Made in New York. Please allow 3-5 days for delivery. Available in White Bronze, Yellow Brass, Solid Sterling Silver, or 10K Gold. 2” in diameter and comes on a chic 28” AND a black cord so you can wear it however you want - high or low. Made in New York. An ancient symbol made of seven overlapping circles, depicting the seven days of creation. 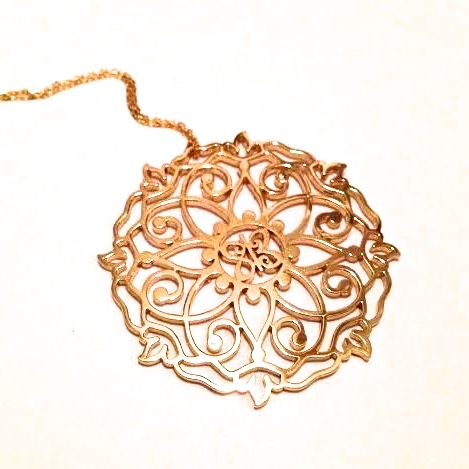 It is considered by some to be a symbol of sacred geometry, which is said to contain spiritual value. In the ancient world, certain numbers had symbolic meaning. 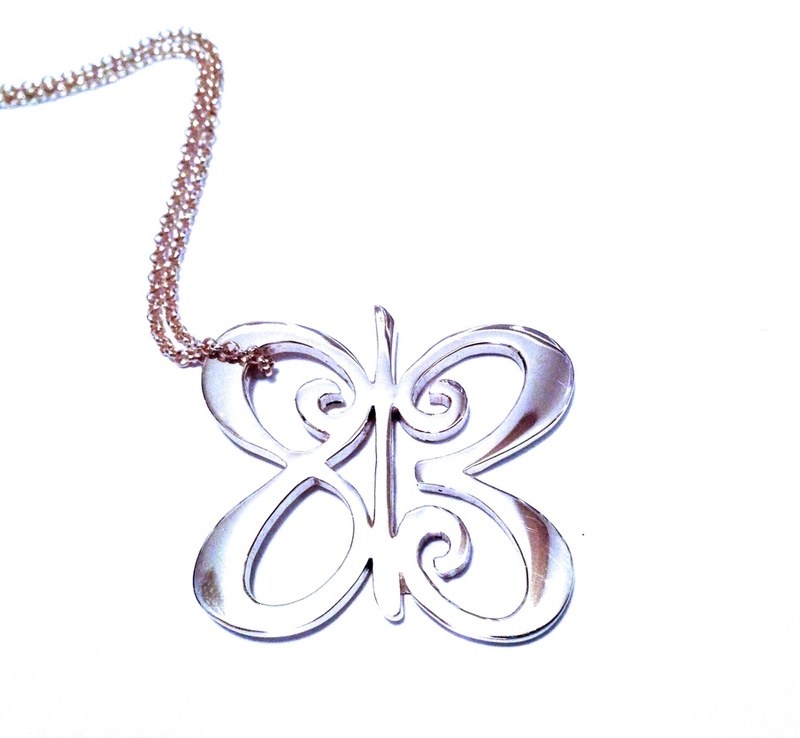 Ours certainly does - it contains our One Meaning Butterfly made of an 813 in its center, which means “I love you” celebrating feminine complexity and a life core centered around love. We are all connected.